Polite but clearly bored with the crowds and noise of the market, the Frau hands me a novelty mug filled with steaming wine. The florid red cup is shaped like a Christmas stocking. A thick sprig of ceramic mistletoe forms the chunky handle. It's hideous. But the hot wine inside is warming (in more ways than one – it's stronger than I expect) and the snow flakes are continuing to fall: I need all the help I can get to stay warm this afternoon. 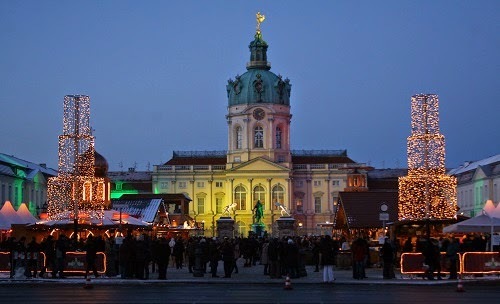 Charlottenburg Palace's Christmas market is one of the best known in Berlin. Set in the front of the summer palace of Sophia Charlotte of Hanover, the market features an eclectic mix of fancy gifts and rustic snacks. Shining pop-up shops selling luxury leather bags or hand-crafted silver jewellery sit side by side with the simple wooden stalls of the sausage sellers. The air is infused with garlic and onion, coffee and sugar. The market is not a place for dieters. There's a man selling hot candied nuts; you can smell his tempting wares long before you see him. Then follow your nose to a steaming vat of garlic-drenched mushrooms, slippery and glossy with melted butter. Of course I have to try some: vegetables are supposed to be good for you, aren't they? Nearby, every imaginable fruit is available skewered and covered in chocolate or a bright crimson candy coating: apples, cherries, apricots... a glutton's version of your five a day. I hold out as long as I can (a feat of Herculean will power), but I'm finally seduced by a stall devoted to roast pork. My flat-bread comes stuffed with hot and dripping slices of roast meat, piles of tangy sauerkraut, and smothered in thick sour cream. Bigger than my head, I need both hands to hold it. A Chinese tourist, camera slung round his neck, gazes longingly at my sandwich. I grin, and point him in the direction of the right stall. We don't speak. We don't need to. Greed is a universal language. So full I'm not so much walking as waddling, I wander through the crowds of the market, sipping my hot wine, brushing snowflakes off my lashes, and stamping my frozen feet to keep the circulation going. You can tell the Berliners from the tourists. The locals are the ones with thick gloves and waterproof boots. The tourists are the ones in inadequate shoes, fluttering about trying to stay warm. Loudspeakers play old-fashioned carols and cheery jingles; later a choir will sing. Behind all this activity, the baroque dome of the palace is lit by a succession of coloured lights: pink, green, blue. I long to linger and listen to the music, but I'm far too cold to stop moving. Heading back on foot towards the department stores and restaurants of City West, I pass a series of Christmas installations. A twelve foot high Santa Claus figurine, covered in red mini lights, stands on a traffic island in the middle of Kurfurstendamm, the busy shopping street better known as Kudamm. 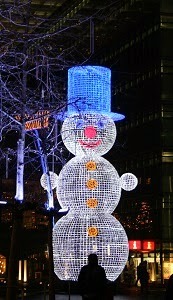 A series of sparkling snowmen nestle between a chain clothing shop and a boutique hotel. The snowmen wear blue taps hats and pink noses. Groups of teenagers with mobile phones snap photos of each other posing in front of the lights. Finally, near the crowded temple to consumerism that is the KaDeWe department store, I give in and buy a pair of fleece-lined winter boots. I ask the clerk to remove the tags, so I can wear them out of the shop. She gives me a look that says “tourist” and I grin. Full of hot wine and garlic-soaked mushrooms, with warm feet I can conquer the world (or at least the next Christmas market). Luckily, in Berlin that's never very far away.